The talented Kris Waldher has redone my website and folded my blog into it. So, I will now be posting updates there. Please bookmark the new site if you would like to keep on reading my blog. Author Judy Ridgley tagged me in a "Meet my Main Character" blog-hop chain. So come on along and I'll tag others who might want to play. 1. What is name of your character? Is he/she fictional or a historic person? with Lucia, the daughter of the man who owns him (and she with him), which, as you can imagine, is a bit of a problem. Both characters are fictional. 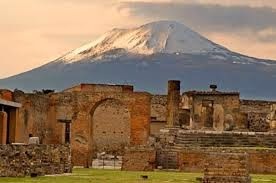 The story is set in the weeks before the eruption of Mount Vesuvius in Pompeii in 79 CE. Tag’s ancestors came from noble Etruscan stock but his family was thrown into slavery when Rome took Pompeii during the “Social Wars” generations before. He is bitterly resentful of the Roman “occupation” of Pompeii (even at the time of the city’s destruction, the Romans still called Pompeii their “colony”). Although in his heart he is a healer, Tag dreams of training to fight in the arena as a means to win his freedom. 4. What is the main conflict—what messes up his life? The main conflict is that he falls in love with the daughter of the man who owns him. Any kind of relationship between them would’ve been seen as a major taboo. In addition, his father is beginning to lose his faculties and he is desperate to keep the master from noticing because he is afraid his owner would throw the aged healer out on the street once he lost his usefulness. Tag’s personal goal is to earn his freedom. The quickest way to do that, he thinks, is to train like a gladiator. If he wins enough bouts, he could be freed—or die trying. When he and Lucia get together, his goal changes and he dreams of running away with her, even though he knows he would be crucified for touching her. 6. What is the book’s title and when will it come out? 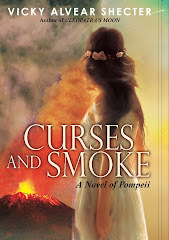 The title is Curses and Smoke: A Novel of Pompeii. 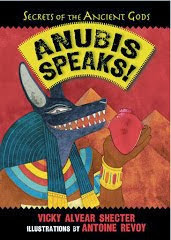 It is published by Arthur A. Levine/Scholastic and releases May 27. About the book: A kid-friendly, humorous, and fact-filled biography of the "original teen queen." VOYA (Voice of Youth Advocates) placed it on its "Honor List" for nonfiction. Booklist said of the book: “Shecter's solid research is evident in her account of events as well as the back matter, which includes informative notes, a time line, a glossary, bibliographies of primary and secondary sources, and source notes for the illustrations.” Kirkus described the book as "a lively, informative, and aggressively informal portrait of Egypt's last and most famous pharaoh." Was the last queen of Egypt an evil, gorgeous woman, dripping with jewels? A power-hungry tempress trying to rule the world? A pharaoh with a small snake problem? Everything you’ve read about Queen Cleopatra VII should have come with a warning: details may have been “Photoshopped” and manipulated beyond recognition. The Queen of the Nile had more mud flung at her than you can dig up on the banks of that great river. From Shakespeare to Hollywood, what you’ve seen and read about her wasn’t always completely true. Hollywood made her into a hot starlet because nobody wanted to see an ugly queen. Historians turned her into a power-hungry witch because that made her story more interesting. And her Roman conqueror, Octavian, made her into a weapon of mass destruction in heels so he could stomp all over Mark Antony. Will we ever know the “real” Cleopatra? Without her personal letters and journals, probably not. But for the first time, modern scholars and historians are looking at events from the queen’s point of view. What they are finding is that Queen Cleopatra VII , the last pharaoh of Egypt, was in fact a brilliant, complex, powerful ruler. For twenty years, she kept the world’s greatest superpower from taking over her country—a good trick when you realize it was during the time when Rome swallowed up countries faster than most teens use up text minutes. The answer may shock and surprise you—and may even make you laugh. Either way, you’ll get a more balanced look at Cleopatra the queen, the ruler, and mother of four. So, on your knees, commoner. The last great queen of Egypt is about to take the stage! She ruled all of Egypt, had Romans trembling in their togas, and made kings weak at the knees. Yet the glamour queen of the ancient world started out as … a bookish nerd. Yup, the girl whom Shakespeare likened to Venus—the goddess of love—cared more about books than boys. At first, anyway. As a kid, Cleopatra spent most of her time hitting the scrolls at the famous Great Library of Alexandria. 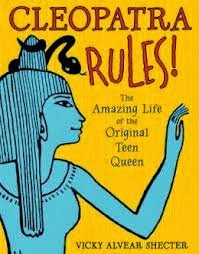 Young Cleopatra had a good reason for being so serious—several reasons, actually: her ambitious brothers and sisters. Life with them was like living with a nest of squirming, hissing reality-show stars—you never knew when one might strike. Would her older sister push Cleopatra down the palace steps to get her out of the way? Would her younger brothers and sister poison her afternoon snack? Or maybe, “accidentally on purpose,” hold her head under the water a little too long while they played in the palace pool? See, Cleopatra’s family was not what you would exactly call … um, loving. Yet while most of her family members cared only for their own personal power, Cleopatra longed to bring back the glory days of her beloved country, which was easier said than done. Corrupt rulers and a long history of border disputes had weakened the once powerful kingdom. By the time Cleopatra came along, Egypt was sliding down the tubes faster than a greased-up preschooler on a Slip ’n Slide. As Egypt declined, Pharaoh Ptolemy XII took his eleven-year-old daughter, Cleopatra VII, on a trip to Rome—not to sightsee but to save his skin. Raging mobs had run him off his throne and out of Alexandria. See, over the years, Daddy Pharaoh had paid Roman generals big bucks in return for soldiers to scare off his enemies. Only he had so many enemies, he had to “buy” more Roman protection than he could afford. And guess who footed the bill—Egyptian citizens, who had to pay extra taxes. When Cleopatra’s dad taxed his people to the breaking point to pay for more Roman henchmen, they chased him out of Alexandria faster than a band of crazed shoppers at a half-off sale. But although the pharaoh may have been out, he wasn’t down. Not without a fight, anyway. So he put his kingdom into even deeper debt—this time to a private Roman loan shark—to pay Roman armies for help in invading his own country. Yes, that’s right, he invaded his own country. It worked. The Roman military put him back in charge. But as a result, his people hated him more than ever. Most rulers want nicknames that reflect their power or glory, like Alexander the Great or William the Conqueror. Cleopatra’s dad? He ended up with a nickname that probably made her cringe. The people called him Auletes—“the Piper”—because Ptolemy (tall-oh-mee) XII liked to play the flute. They didn’t call him the Piper in a nice way, either. Guys who played wind instruments in the ancient world weren’t exactly considered macho. Still, it was better than her grandfather’s nickname. They called him Chick-pea. Before that, the Egyptians called Cleopatra’s great-grandfather—Ptolemy VIII—Fatty, or Physcon, because of his huge size. He needed several servants to hold him up to waddle around the palace! Whatever she thought about these nicknames, Cleopatra likely had a bigger issue with the way her father groveled at the feet of rich Romans. Like her dad, she knew the Egyptians needed Rome to survive. But unlike him, she was determined to find a way to become Rome’s partner, instead of its slave. While “the Piper” and Cleopatra trolled for money in Rome, his oldest daughter, Berenice, snatched the throne and named herself queen. Okay, we know Cleopatra was smart, but could her sister have been any dumber? Think about it: most usurpers (people who steal thrones) usually have the king killed before they name themselves top dog. Yet for some reason, Berenice didn’t. That’s why some scholars wonder if maybe somebody else shoved her on the throne while Daddy was on the road. Or whether she thought Daddy would be assassinated in Rome. Or even thought that angry mobs in Egypt would tear him apart once they heard how much they would owe in taxes to pay the Roman loan shark. Either way, it was a dumb move, because as soon as Daddy regained control of the throne, Berenice parted with more than her crown. She parted with her life, too. The Piper had her pipes cut—she was executed for treason. Turns out that Daddy the Flute Player could turn into Daddy the Destroyer without pausing for breath. Cleopatra took careful note of that move, too. Plutarch needed to make Mark Antony—and therefore Cleopatra—look bad because he did not want to anger the often touchy Roman Emperor(s) of his time. Imagine if Lex Luthor wrote Superman’s bio or Darth Vader dished on Princess Leia. You might find yourself a little skeptical about their claims, right? You might even find yourself doubting—if not laughing outright at—all of the insults and snide remarks. Yet that’s exactly what happened to Cleopatra. Rome won, so Romans told their version of her story. The Romans dissed and dismissed her worse than a fashion critic at the Oscars. Today’s scholars are not so quick to accept everything the Romans wrote about Cleopatra. They look for proof—or at least some evidence—that might either back up or dispute the Romans’ version of events. More importantly, they do what the Romans found unthinkable: they give her the respect of seeing things from her point of view. It’s about time the great queen received the equal—if not royal—treatment she always deserved. After the Piper snuffed his eldest daughter, he retook the throne and went back to playing the flute. Egyptians seethed over having to fork over even more of their hard-earned money in taxes to repay Romans. But what could they do? The streets of Alexandria teemed with Roman soldiers paid to keep the Piper piping and the people quiet. Meanwhile, young Cleopatra chilled at the Great Library of Alexandria, studying science, mathematics, philosophy, and languages. In fact, according to one ancient source, she was the first ruler in nearly 250 years to learn and speak the native Egyptian language! Wait. What? How could Egyptian rulers not speak the native tongue? Easy. Cleopatra’s family—the Ptolemy line of Pharaohs—wasn’t Egyptian. Cleopatra actually descended from the Greeks. 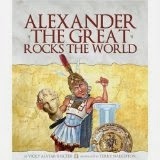 Nearly 250 years earlier, Alexander the Great invaded Egypt and put it under his rule. When he died, his general and self-claimed half brother Ptolemy took over as pharaoh. From then on, his Greek descendants ruled Egypt and spoke only Greek. Even Cleopatra’s name was Greek. It just happened to be the name of Alexander the Great’s little sister. Our Cleo had a talent for languages. In addition to Greek and Egyptian, she spoke numerous African dialects as well as Arabic, Aramaic, Hebrew, Latin, and Persian. But her political smarts were even more impressive. And she couldn’t wait to put them to good use. About the Book: A young adult novel based on the real life of Cleopatra's only surviving child, her daughter, Cleopatra Selene. From her palace in Egypt, to the dirty streets of Rome, Cleopatra Selene is forced to fight to protect the tatters of her family after her parents--Cleopatra and Mark Antony lose their kingdom and their lives. Forced to build a new life in the home of her parent's enemy, Selene struggles to protect her brothers and reclaim her birthright as a powerful queen. 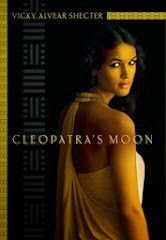 Publisher's Weekly called Cleopatra's Moon, "fascinating" and said said "the novel's atmospheric setting and romantic intrigue are highly memorable." The LA Times called it "magical" and "impressive," while The Wall Street Journal called it "absorbing." The School Library Journal called it "a fantastic read." Other accolades include being named to Entertainment Weekly.com's "Must Read" List and The Atlantic.com's list for "Young Adult Historical Fiction Adults Should Read." I suspect it began in my seventh year, on a day that I once considered one of the happiest of my life. It was a dazzling, sun-drenched summer morning in Alexandria-by-the-Sea. Outside the Royal Quarter, with the Mediterranean sparkling behind us and rows of date palms swaying before us, my mother and brothers and I sat alongside one another on individual thrones. We waited for my father, the great Roman general Marcus Antonius, to finish parading through the city and join us atop our grand ceremonial dais. The ceremony today would celebrate his victory over Armenia, his eastern enemy. And we --- his family and all of Alexandria --- would rejoice with him. Even in the shade of our royal canopy, sweat trickled down my neck and back. The ostrich-feather fans the servants waved over us provided little relief. Strong breezes occasionally gusted from the Royal Harbor, cooling us with the salty bite of the sea. Despite the discomfort and the glare from the beaten silver platform at our feet, I forced myself to keep still as Mother had instructed, my eyes trained just above the horizon. Zosima, who had carefully painted my face, had forbidden me from squinting in the bright light. I was not to ruin the heavy black kohl around my eyes and eyebrows, and under no circumstances to cause the green malachite painted on my lids to flake off. I was not even to turn my head. I would follow all the rules perfectly, I swore to myself. I would make Mother proud. I sat up straighter, trying to emulate her, puffing up with pride at the realization that only Mother and I were dressed as true rulers of Egypt --- she as the Goddess Isis and I as the moon goddess, Nephthys. After all, was I not named for the moon? My brother may have been called Alexandros Helios, for the sun, but I was Cleopatra Selene, the moon. I wore a flowing dress that reminded me of the liquid metal that the scientists at our Great Library described as "living silver." A silver diadem of the moon sat atop my own thickly braided ceremonial wig. Even my sandals flashed silver. I had never seen my beloved city so packed. By the tens of thousands, Alexandrians and Egyptians flooded the wide avenues and byways, desperate to catch a glimpse of us or of Father on his parade route. The richest of the noble Greek families sat on tiered benches in the square before us, while tradesmen, merchants, and the poor spilled into the streets, squirming and jostling for position. Some even shimmied up trees, climbed onto the shoulders of the statues of my ancestors, and scrabbled to the tops of pediments and roofs to get a better view of us. The roar of the crowd as my father approached in his chariot sounded like waves crashing against the rocks on Pharos Island, home of our Great Lighthouse. When Tata climbed onto the dais to join us --- his golden armor gleaming, his face soaked with sweat but shining with joy --- he looked like a god. The God of War! In his deep bass, Father began: "I stand before you as Imperatorto the greatest of all civilizations, made even greater by the loyalty and fealty of its allies. Today, we remind the world that it is far, far wiser to be Rome's Friend rather than her Enemy." "The foolish King Aatavartes of Medea thought to test Rome's strength," he continued, the crowd groaning at the king's stupidity. "He sought to ally with Rome and Egypt's enemy in a greedy bid for power and riches. He thought to claim our weapons and weaken us. But he could not, for Rome and Egypt are blessed by the gods, our victory proof of the favor with which the Immortal Ones hold us . . ." I lost track of Tata's speech then and started counting the golden beads on the fan slave's broad collar. I had gotten up to forty-seven (after having to start over several times) when Father's voice cut through my reverie. "It is time," he announced, "to make my Dispositions of War, to reward Egypt for her unceasing loyalty." The crowd whooped and stomped. I perked up. Tata was about to bestow his gifts to us, his family. To me! My mind raced with the possibilities. Was I to receive a new crown from his plunderings? A golden chariot? Or perhaps an exotic beast, maybe even one that breathed fire? Tata turned toward my two-year-old brother, Ptolemy Philadelphos, who sat beside me. Ptolly looked just like our tata, with a head of shining dark curls, mischievous brown eyes, and the barrel-chested body of a bull. The crowds had swooned with adoration at the first sight of him swaggering in his tiny military cloak and boots. "To my youngest son, Ptolemy XVI Philadelphos," Father bellowed as the crowd hushed in anticipation, "I grant the lands of Phoenicia, Syria, and Cilicia." "Look at Tata," I instructed. "He is talking to you!" Ptolly locked eyes with Father. When Tata grinned at him, Ptolly grinned back, showing all his little milk teeth. Then he toddled toward Tata, to the crowd's cooing delight. One of the guards intercepted him and escorted the little general off the dais. "To my daughter, Princess Cleopatra VIII Selene," Father called, and I felt the attention of thousands land on me like a physical force --- an energy that made me sit up straighter and raise my chin, despite my racing heart. "I confer Cyrenaica and Crete, where she will rule as queen. May she rule with as much wisdom as her namesake." I was queen! Queen of Cyrenaica and Crete! As the people thundered their approval, Tata caught my eye and winked. Forgetting protocol again, I grinned and inclined my head. This sent the crowds roaring even louder, and I heard my name chanted over and over again. I marveled at the power pulsating all around us --- power freely laid at our feet, ours for the taking. "To my son, Alexandros Helios, I bestow the kingdom of Armenia, where he will rule with his betrothed, Princess Iotape of Medea." The crowds whooped in honor of Father's decisive victory in the region, but I refused to steal even a side-glance in my twin's direction. The Interloper sat between us. The black-eyed, silken-haired little princess was nothing more than a royal hostage --- a guarantee that her father the king would stay loyal to Tata. But I could find no warmth in my heart for her. The way Alexandros acted around Iotape, it was as if Hermes himself had come down from Mount Olympus and hand delivered her to him. Until she showed up, he and I had lived as if we still shared a womb --- playing, sleeping, eating, and laughing together. But now it was Iotape my twin sought out at first light and played with until dusk, when Ra's sunboat descended into the Dark Lands. I would not forgive her for taking him from me. Still, our people continued to cheer at the announcement, celebrating the return of a strong and vital Egypt. Armenia and Cyrenaica had been under our dominion when our Macedonian-Greek ancestor Alexander the Great and our dynasty's founder, his brother Ptolemy theFirst, took Egypt nearly three hundred years ago. We Greeks had ruled ever since. And now, thanks to Tata, we were stronger than we had been in centuries. "In addition," Tata bellowed, "I bequeath to Alexandros Helios and his betrothed rule over all the lands of Parthia!" I barely noticed the undercurrent of bewilderment that rippled through the crowds, the whispers of, "How could the General give away lands he has not yet conquered?" After all, my tata was the best general in the world. Of course he would conquer Parthia! Tata then turned his attention to my older half brother, Caesarion, the only son of Mother's first husband, Julius Caesar. At thirteen, Caesarion was slim and tall, and I thought he looked magnificent in the kilt and pectoral of a pharaoh, combined with his father's bloodred Roman cloak. "Ptolemy XV Philopator Philometor Caesar," Tata called, "I name you the true heir and only son of Gaius Julius Caesar. And I name you the king of Egypt!" But again, murmurs of unease snaked through the crowds, accompanied by whispers of a name I did not then know:Octavianus. I blinked, confused. Why should a Roman name be on our people's lips when Caesarion was rightly being named their king? I tried to make sense of the murmurs: "Isn't Octavianus Caesar's heir?" "Is Antonius challenging him?" Some in the crowd even made the sign of protection against evil. I stole a glance at Mother. She let out a breath that sounded like a hiss. And although her face kept its expression of queenly impassivity, I saw a flicker of concern settle on the tiny space between her brows. But it may have only been a trick of the fierce Egyptian light, for when I looked again, Mother's face appeared as majestic and untroubled as it always had. Tata glanced at Mother, and his eyes crinkled before he turned back to the crowds. "To my wife, Cleopatra VII Philopator, Queen of Egypt and overlord of all the kingdoms bestowed today . . ." A rumble of cheers, shouts, and joyous exultations interrupted him, almost as if our people were thrilled to move on to what they knew and loved. The cheers swelled until I felt them vibrating in my chest bones. Mother did not move as the entire city chanted, "Isis! Isis! Hail Isis! Isis our queen!" When the wave of noise crested, Tata began again. "Today," he boomed, "I name my wife Queen of Kings, Ruler of the Two Lands, Overlord of our Children's Territories, and Partner in managing Rome's interests in the East. I have a vision of the future --- a vision of cooperation, not destruction. Borne up by the loyalty of client kings and queens, Rome cannot be stopped." He swept his arm toward the Lighthouse. "And like Pharos that shines into the night, Egypt serves as a beacon to Rome's future. A future of partnership. A future of immeasurable wealth. A future that no man or king can rend asunder!" The whoops of joy became deafening. Tata grinned and held both arms up in exultation. He bid Mother stand next to him. The bright Egyptian light seemed somehow concentrated on them --- I had never seen them look more godlike. As the priests and priestesses chanted the final prayers, I wanted to jump and cheer and laugh. It was my family's proudest moment! I drank it all in --- the masses cheering; the white-robed Priests of Serapis chanting over bowls of smoky incense; the long-haired Priestesses of Isis extending their thin arms to the sky; the sweet fragrance of flowers as countless petals swirled around us, floating through the air like tiny perfumed birds. It was all so beautiful, almost magical. The Triumph of the Ptolemies! The greatest moment of our lives. But the gods would not stand for us to have such happiness for long. And so began the slow, excruciating process of our undoing.